These mouthwatering chocolate morsels have been getting made on repeat in our home lately! They’re super quick and easy to make, and I’ve been doing lots of experiments with sugar free recipes and these are my favourite one yet! I shared this recipe on my IG this week but figured its much easier to have the recipe right here on my blog! The fresh raspberries add a nice tang to the centre plus sweetening with stevia, a natural sugar free sweetener. The richness of the cacao and cacao butter make just half a serving enough to totally satisfy any sweet cravings and if you’ve never made your own chocolate at home, you’ll be surprised by just how quick and easy it is! I’d say these take me 10 minutes to whip up (If I’m not fussing over how they look aesthetically). Theres also a generous layer of deliciously smooth peanut butter inside these morsels. Of course you can swap out the peanut butter for any kind of nut butter that tickles your fancy, but lets be real, peanut butter is the holy grail of nut butters. I especially love 'Pic's peanut butter', its insanely smooth and melt-in-your-mouth kinda goodness, made from Aussie peanuts of course. BUT wait, before you dive into the recipe there is one special ingredient that needs an introduction here! 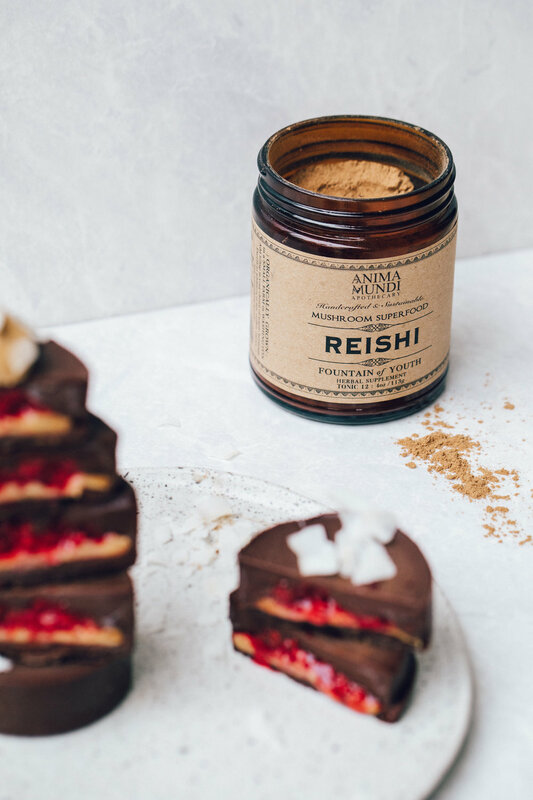 These delicious chocolates are taken to the next level with the addition of Anima Mundi Herbals Reishi Powder. Reishi is a powerful herbal mushroom that has been used for centuries in Chinese Medicine, also know as the 'mushroom of immortality'. It is believed to be calming (perfect before bedtime) for the mind and studies have shown the reishi mushroom to enhance our immune system (an immunomodulator). Some studies in-vitro (cancer cells) and in animals have shown anti-cancer properties of the reishi mushroom however extensive human testing have not been done, this means there is potential for its use in cancer but more research needs to be done before it can be advised as it can interfere with cancer treatments. I am super interested and (just quietly) obsessed with herbal mushrooms and reishi might just be my favourite. Cacao and Reishi are also the perfect pair as the alkaloids in Cacao is a great carrier for Reishi, allowing our body to assimilate its powerful chemistry. 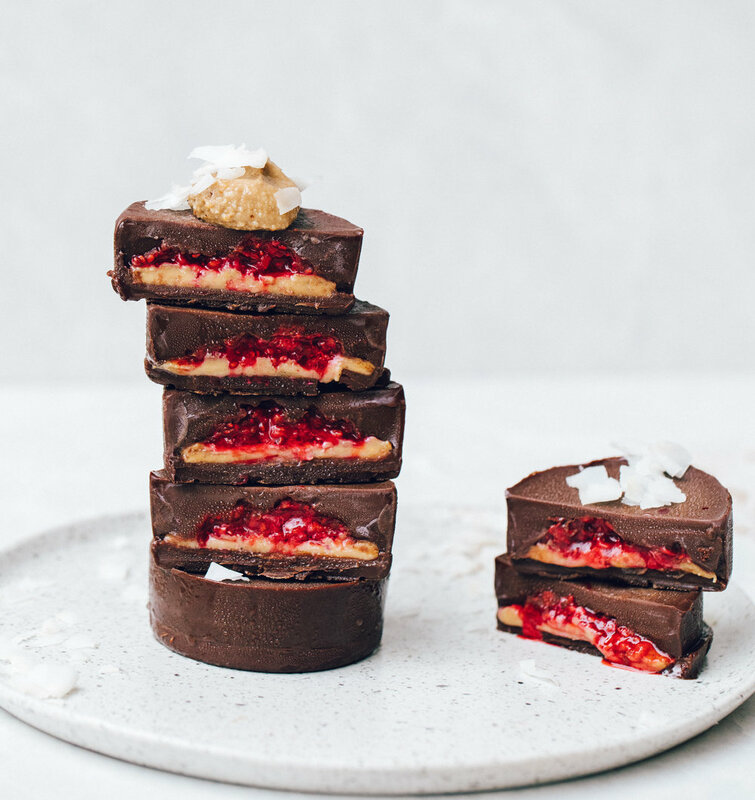 Basically, Reishi makes these epic chocolates even more super! Click here to check out their full range of herbal powders. Anima Mundi Herbals have so Kindly offered me a discount code to share with my readers, you can use 'ELSA20' for 20% off their entire range! I also use religiously the Adaptogenic Powder and Vegan Collagen in my smoothies and hot drinks. Okay so lets get straight to that delicious recipe! Begin by making the raspberry jam. Crumble up the raspberries in a bowl and stir through the chia seeds. Set aside on the bench to defrost. Next begin making the chocolate mix. Stir all the chocolate ingredients together, (all other ingredients except the peanut butter) spoon 1/2 of the mixture into silicone cupcake moulds (approx 4), stirring between each spoonful to prevent the mushroom and stevia setting on the bottom. Place moulds in the freezer to set for 5-10 minutes. Remove moulds from freezer and spoon 1 heaped tsp of peanut butter in the centre of each. Using the back of a spoon spread the peanut butter into a disk that is slightly smaller than the diameter of the chocolate base. Spoon the raspberry jam on top of the peanut butter. Spoon the remaining chocolate mixture into the cups, ensuring the raspberries are covered. Place in the freezer for 5-10 more minutes or until set. The chocolate will begin to melt when removed from the freezer in warmer climates. Store in the fridge or freezer. Eat straight from the fridge or freezer! If you want a version that doesn’t melt so quickly, try replacing the coconut oil with additional cacao butter as it has a much higher melting point. I prefer to cut them in half and only eat 1/2 per serving as they’re quite rich and chocolatey! Enough to curb any sweet craving. For the sugar free option: I have used a stevia and erythritol powder blend that is double strength of sugar (1/2 tsp = 1 tsp of sugar), if using a different kind of sweetener follow your taste preference for how much sugar/sugar free sweetener to add. I recommend approximately 3 tsp of liquid sweetener (e.g. maple syrup, coconut syrup, or rice malt) or its equivalent in sugar free sweeteners. Sign up with your email address to receive a free mini e-book!